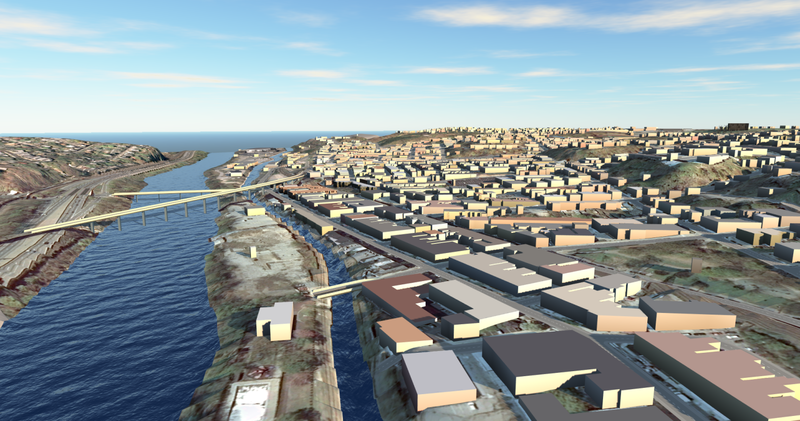 InfraWorks is a tool for winning proposals, graphically telling a story, and start to understand design complications before the actual engineering begins. It uses the same data types that can be imported (or exported) into Civil 3D or Map3D. So, as you generate your InfraWorks model, you’re actually gathering essential and important information early in the process. Also, InfraWorks allows a direct data exchange using the .IMX format. InfraWorks really fills the niche a lot of firms have been looking for. 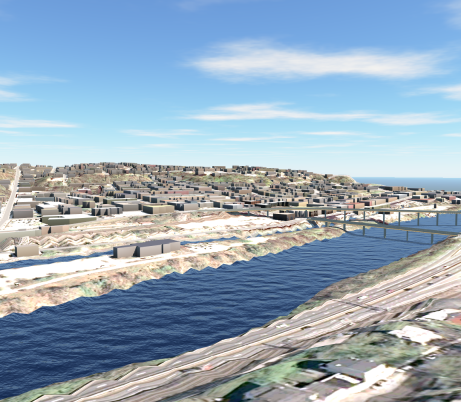 At first, Civil 3D was the design and the graphic display tool firms used. Although Civil 3D can produce nice renderings, it’s limited on size. Meaning, it would be difficult to create a whole city worth of information and render it as well. Furthermore, Civil 3D is an engineering tool, it’s main objective is to create very precise plans with very accurate information (pipe inverts and surface elevations…). Second, Autodesk released the tool “Export to Civil View for 3ds Max Design.” This was a great function and allowed high-end renderings for 3D models. The problem with this solution was the complexity of learning a second software program (3Ds Max) or hiring a graphic artist to help in this area. Beyond that issue, there is no coordinate system within 3Ds Max and results in a disconnect between GIS data and the 3Ds model. First of all, InfraWorks directly importes GIS information in its native format, along with many other data types. Second, it does and will automatically assign coordinate systems to the project. With this coordinate system automatically assigned, the sun’s placement and shadows studies are automatically computed and no extra effort is needed. Different GIS coordinates are automatically transformed and aligned to match the parent model. 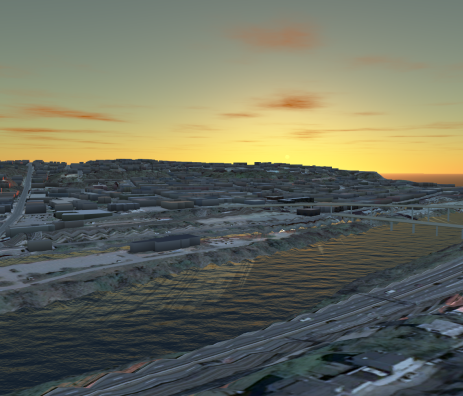 When importing GIS information (.shp and .sdf), instead of single lines or outlines, Infraworks converts this data into realistic objects; representing graphic roads and water bodies. Infraworks also makes it simple to add moving clouds, sun sets, wind speed, and wind direction; which are all just a click of a button. 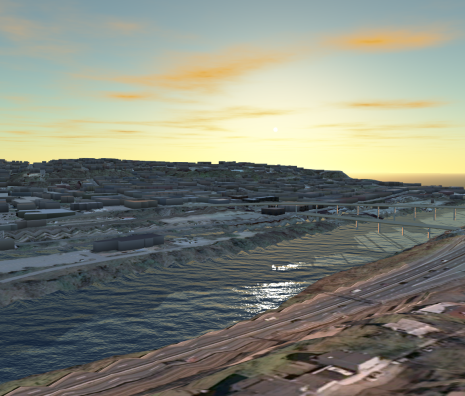 So in the end, Infraworks does not provide the precision of Civil 3D. Nor so, does it provide the highest rendering capabilities, such as 3Ds Max. But it’s a easy to learn tool, that merges the best of both worlds into one creative model that provides a visual story for conveying your design intent. Jesse specializes in Infrastructure (Civil/GIS) as a Synergis Solutions Engineer, and brings a spectrum of industry experience with him to Synergis. He has his associate’s degree in Architectural Design, a certification in AutoCAD Release 14 (R14), and is also a Microsoft Certified Professional (MCP). First introduced to Autodesk products in 1997, he became State certified and began using R14 in the manufacturing industry to design parts for Boeing airplanes. After returning to school and obtaining his Associates Degree in Architectural Design, Jesse was employed by a consulting engineering firm as a Technical Civil Engineering Designer. As a Civil Designer, he developed skills in Civil 3D, Land Desktop Development (LDT), Map 3D, Raster Design, and Survey. He has worked on many different levels of land development and survey projects, from hospitals to highways, rivers to residential, schools to subdivisions. With over 10 years of experience using Autodesk Products, Jesse considers learning the best way to build confidence and a brighter future. He firmly believes that understanding the Autodesk solutions can help anybody produce faster, have greater precision, and be more valuable on the market.